Make sure your ricotta is dry. Place it in a colander over a bowl, wrapped in plastic wrap to drip-dry over night. The next day, push your ricotta through a fine meshed sieve, to make sure it's smooth. Use the back of a plastic spatula to push it through. Melt 1 tbsp of your butter. Add your eggs, melted butter, a dash of salt, mashed potatoes and ¼ cup of parmesan cheese. Mix well. Form your dough into small dumplings, You can do this by rolling long logs in parmesan cheese, then cutting the logs into smaller dumplings. You can use a spoon and drop each dumpling into grated parmesan. You can also use a very small ice cream scoop for it (chances are, you won't have this, though). Here's what I did: I put the dough into a pastry bag, without a tip. I also set up a platter with freshly grated (the finest grate) parmesan cheese. Then, I placed the pastry bag in one hand, with a steak knife in the other. I extruded the dough out of the tip, while using the steak knife to cut the dough-stream every inch. This created a quick succession of small inch long cylinders, each dropping into random spots on the parmesan. I did this until I was out of dough. Place the formed dumplings onto a platter coated with the remaining ¾ cup of parmesan cheese. Make sure the dumplings are well coated with the cheese. Refrigerate the dumplings for 30 minutes up to overnight. Boil a large pot of salted water. Once the water is boiling, turn it down to a very slow simmer. Add your gnocchi to the water, carefully. Don't just dump them in. These are delicate. Carefully pick them up and add them one at a time, or in small batches of 5 or 6. They will sink. Try and add them all over a 60 second period. Once they've all been added, let them cook for 5 minutes. Never let the water boil. It should be very hot, but not boiling. 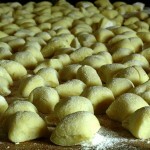 The gnocchi should start floating after about 1 to 2 minutes. Continue to let them cook for 3 or so more minutes, for a total of 5. 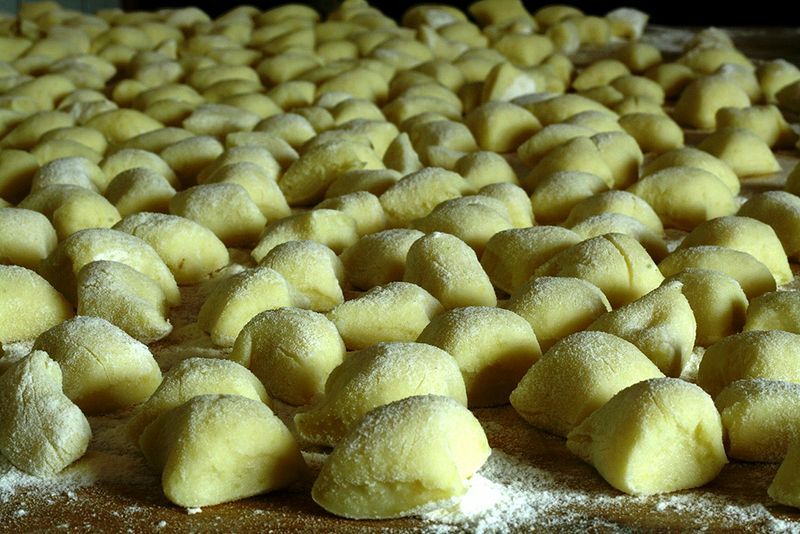 With a slotted spoon, carefully lift the gnocchi out of the water and place them into a strainer, so they can dry. If you're too aggressive with these, they will fall apart. Be gentle. In a large sauté pan, melt the remaining butter over medium heat. The moment any of the butter begin to turn a very light shade of tan, carefully add a few gnocchi. Toss them in the pan to coat them with butter. Add a few more, toss them around. Add a new more, etc. You want them to fry in the butter. You may need to do this in two batches. A little color on the butter can add a nice flavor. Once they are fried, remove them from the pan and serve them with marinara sauce, or simply fried in butter, with maybe a little sage and topped with grated parmesan cheese as a garnish!